Today I changed my approach, I took a train in the morning to Groningen, on arrival I took off on my bike towards Amsterdam, on the ride I pass through Assen, Meppel, Kampen, Dronten, and Almere. In Kampen there was a celebration of some kind, the city center was closed down for traffic and a number of tall ships were in the harbor. It was a tuff ride, it started in rainy condition, so I dressed up in rain clothes, I did not have any rain socks for my bike shoes with me, so I took off my socks. Near Assen, the weather cleared up, and up to Dronten the weather was fine, then after Dronten, a heavy rain shower came in lasted for 20 minutes, the last 30 km was hard, I just had fumes left when I reach home. What an intense ride! 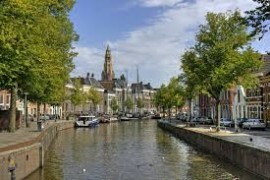 I would love to see Kampen.